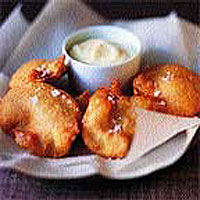 It's well worth getting out the deep-fat fryer for these calorie-laden treats. Serve hot, with plenty of garlic mayonnaise for dipping. Sift the flour and 1 tsp salt into a bowl. Make a well in the centre, add the egg yolks and lager, and whisk until smooth. Heat the oil in a deep fat fryer to 175-180°C. Just before cooking, place the egg whites and the cream of tartar in a clean bowl and whisk until foamy and stiff. Fold into the batter. Mix the potatoes into the batter, stirring gently until well coated. Fry the potatoes, in batches of 7-9 slices at a time, for 4-5 minutes. Adjust the heat so that the coating doesn't brown too much before the potatoes have cooked. Drain on kitchen paper, sprinkle with sea salt and serve immediately with garlic mayonnaise.